So, you’re an avid golfer, hitting the green every day of the week and doing everything you can to increase your skills with the game. Or maybe you’re more of the weekend warrior type, and you just want to learn some more of the mechanics of golfing. Either way, there are a lot of subtle mechanics in play behind the scenes. And all of them have a direct impact on how your ball will fly. The technique behind the perfect swing can take a lifetime to master (maybe that’s just one more of those things that make golf so popular). But by answering these two questions, you may be able to identify some of your problem areas. How much do I use my arms to swing the club? The strength that comes from your arms, while an important factor, pales in comparison to the strength found in your shoulders. Turn your body so that you have plenty of room to add more shoulder movement into your swing, and you will be amazed at how much further your balls will fly. Am I leading with my hips? Leading your swing with your hips more than doubles the torque that you can achieve with your swing. Don’t believe me? First, your body should be at an angle that faces far enough away from the tee to allow you ample time to rotate your hips. Next, assume your usual position for striking the ball. Third, turn your hips to where they normally are then follow through with your swing. This technique is a staple among all the golfing pros, and can easily add another 20 yards onto your swing. Every part of your body is interconnected. Remember this next time you hit the green. If you’re head is in an uncomfortable position, it will cause the rest of your body to become incredibly tense. This is a major stumbling block for most golfers. Thankfully, there is an easy remedy for this situation. All you have to do is keep your head cocked, then mimic the action of your shoulder. Remember this saying: “Shoulder up, head up, shoulder down, head down”. This will keep your form loose, and transform your game. What Are These Dimples & What Do They Do? I’m sure you’ve noticed the dimples in your golf balls. These dimples aren’t to make the golf ball easier to pick up or give you a better grip to place on the tee. They are actually a feature in the design engineered to take advantage of different transient force effects. 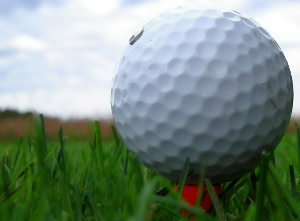 How much farther do you think a dimpled golf ball will fly than one that features a smooth surface? Would you believe that the rough ball can fly up to twice as far? When hit with appropriate force and backspin, a rough surfaced ball will achieve more lift. This is due to how it moves the air around it. For golf balls the best speed to get the results of this effect is between 55 and 95 mph. This effect was actually observed by Isacc Newton more than 300 years ago! The first person to study this effect when applied to golf balls was professor Gutherie Tait in the 1890’s at Edinburgh University. Pretty prestigious for a golf ball, huh? With these tips, you are well on your way to becoming the best golfer that you can be. Just remember to stretch and warm up before you start playing, because nothing ruins a game of golf like a pulled muscle first thing in the morning. Anyway, happy golfing!